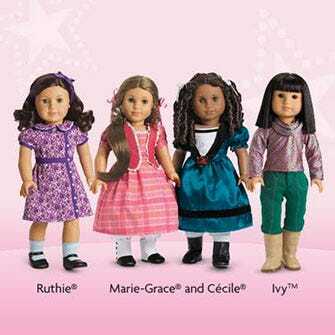 Photo: Courtesy of American Girl. According to totally unofficial scientific research, American Girl dolls are a leading cause of nostalgia among millennials. So, it may come as a shock to the Samantha lovers of a certain age that the toy company's lineup has changed so drastically in recent years. The newest dolls — Girl of the Year? Bitty Twins? — are so unrecognizable it's enough to make OG American Girl fans feel like they're about 100 years old. The company just announced another round of changes to the collection, and it's ruffling feathers for more than a few reasons. Characters Ruthie, Marie-Grace, Cécile, and Ivy are all retiring, and the Historical Collection will be known as BeForever come this fall. It may not seem like a big deal, but that takes away two dolls of color from an already not-very-diverse group. After African-American Cécile and Asian-American Ivy go the way of Samantha (RIP! ), that leaves only three non-white characters.